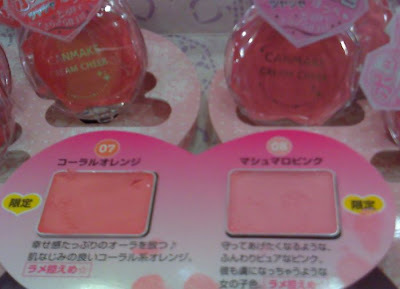 Canmake has released two limited edition shades of its popular Cream Cheek (S$15.90) blushes, #7 Coral Orange and #8 Marshmallow Pink. 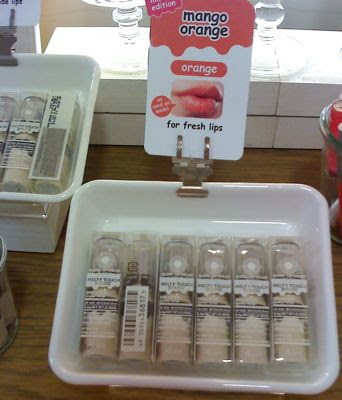 Came across the display below in the Watsons in Ngee Ann City. I also saw the display in the Watsons in Bugis Junction but it had the wrong tester shade for #8 as the tester was brown instead of the baby pink that #8 is supposed to be. The pic below shows #8 Marshmallow Pink on the left and #7 Coral Orange on the right. 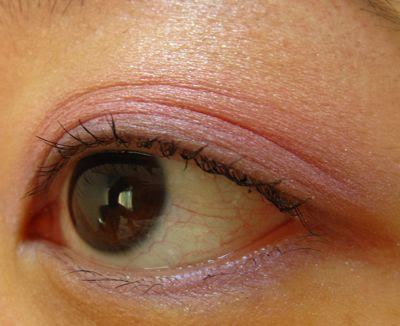 #8 Marshmallow Pink is a very pale baby pink and less pigmented compared to #7 Coral Orange. #8 would probably look best on very fair skinned ladies whereas #7 would suit a wider range of skin tones. 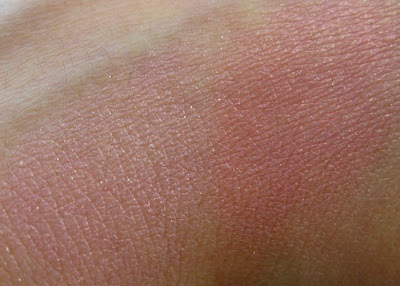 #7 does not apply as orange-toned as #4 Vitamin Orange but instead is more rosy. These apply very smoothly and are easy to blend, drying to a powder finish without any greasiness. 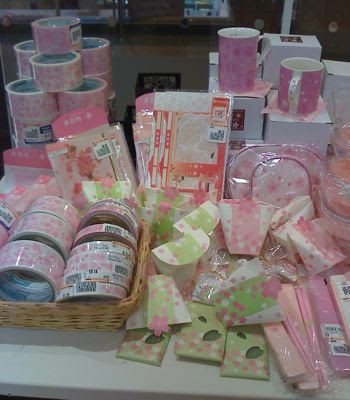 Speaking of all things pink, Takashimaya currently has a corner on Level B1 devoted to Japanese products, including an entire section of cherry blossom stuff! 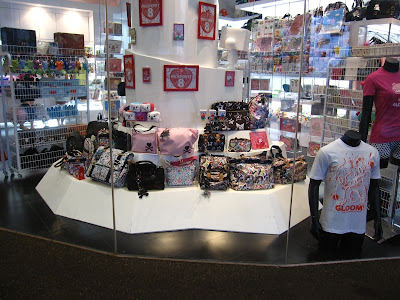 This post is for Justine of Sakuras & Sunshine who shares my love of all things Tokidoki :-) I received an email alert from the Play Imaginative store at Iluma mall informing that the new Watercolor collection is in. Dropped by the store to check them out yesterday but ended up passing on them because of the ugly plasticky pink trim around the edges of several of the bags, especially the Incontro and Elegante bags. The trim just spoilt the bags for me. The thinner strap material, I can still barely put up with but the cheap-looking plasticky trim is a deal-breaker. 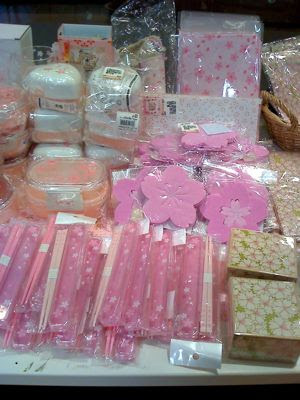 You can see the Watercolor Nobile bag in the centre of the display under the baby pink bag. The print itself is quite cute thanks to the cheerful mix of colours even though I'm not a fan of the Tokidoki girls. 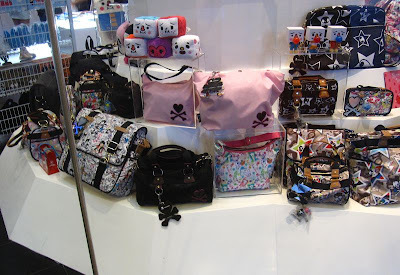 Hope Tokidoki listens to the negative feedback from its long-time customers regarding the recent bag releases and returns to the quality of the LeSportSac years. 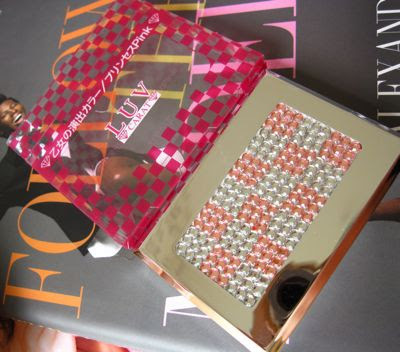 Luv Carat is a Japanese makeup brand that is known for its crystal-encrusted compacts. 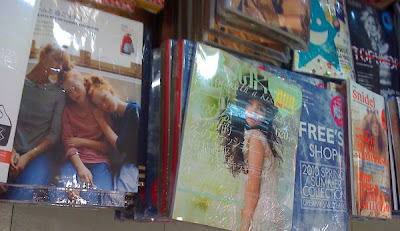 In Singapore, the line can be found at Sasa stores. 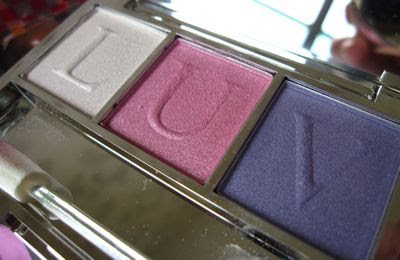 Pictured below is the Luv Carat Eyeshadow Palette in Princess Pink which retails for S$39.90 at Sasa. 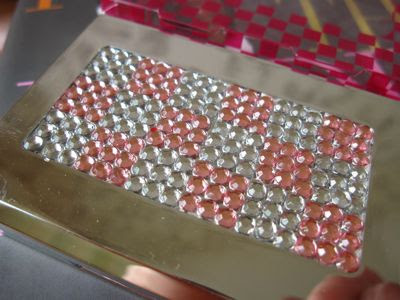 The lid is all blinged out with clear and pink crystals. 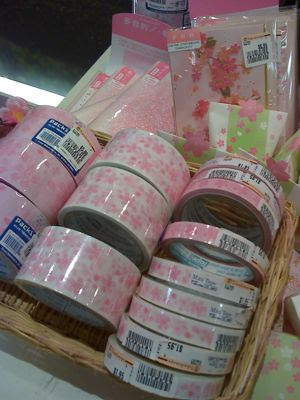 According to the product packaging, it is designed in Japan and made in Taiwan. 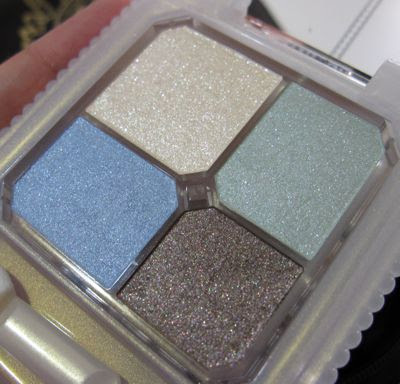 Given the name and packaging, one would expect intensely shiny eyeshadows but the trio of powder eyeshadows have a soft glimmer and a satiny finish. There are no glitter bits, thankfully. 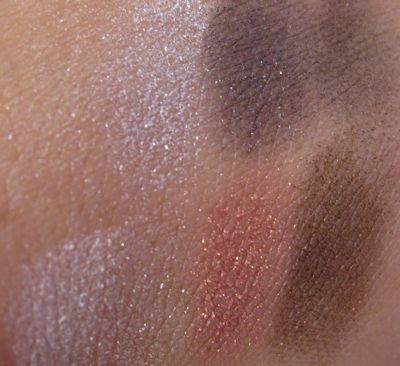 The eyeshadows apply sheer at first but can be layered for greater intensity. 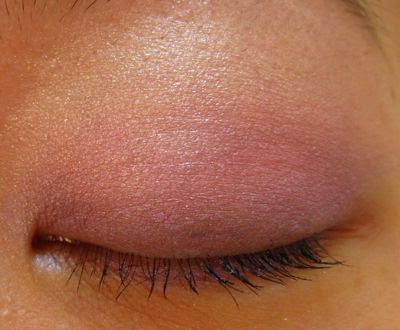 The purple shade complements the pink shade very nicely for a sweet, feminine look. I used the included sponge applicator to apply the white shade over the browbone area down to the inner corners, the pink shade from the upper lashline to the crease, and the purple shade along the upper and lowerlashline. 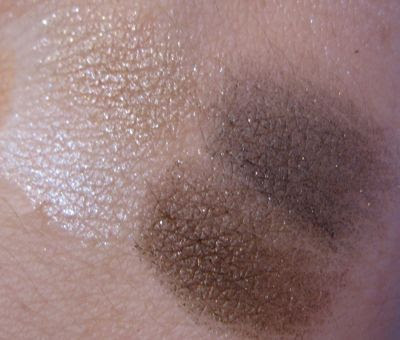 The eyeshadows lasted well on me over more than 5 hours of wear without fading, oxidising or creasing. (I also used Testimo Bright Up Eye Base as the primer. 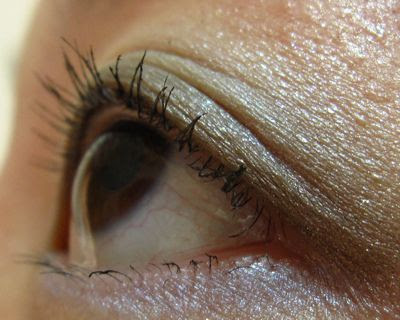 What I found impressive was that the purple shade lasted very well on my lower lashline without falling into the fine lines, fading or smudging like some other eyeshadows or eyeliner tend to do. 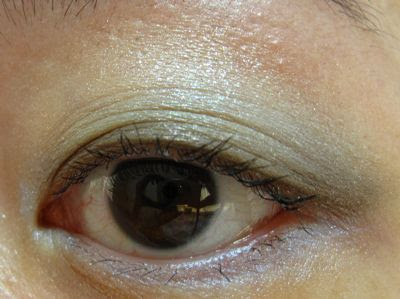 I used Majolica Majorca's Lash Bone Black Fibre In and Lash Enamel Glamour Volume On on my lashes. 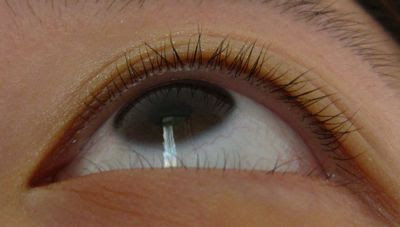 Again, I encountered the clumping problem which fortunately could be fixed by just gently pressing the excess mascara out using my fingertips. 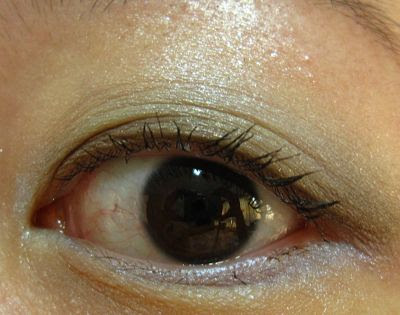 (The pics are taken after I removed the clumps.) My lashes stayed curled without any flaking or smudging over several hours of wear. I'm going to try using Lash Enamel Glamour Volume On by itself without Lash Bone next to see if it reduces the clumping. 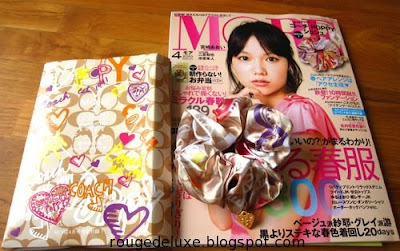 Stopped by Kinokuniya (Ngee Ann City) to snag the April issue of More magazine (S$18.10) as it comes with a Coach Poppy scrunchie. I'm not a Coach fan at all but the Poppy print looked very colourful and vibrant. This issue is already sold out at the Kino store in Bugis Junction but there are still a few copies at the Ngee Ann City store. 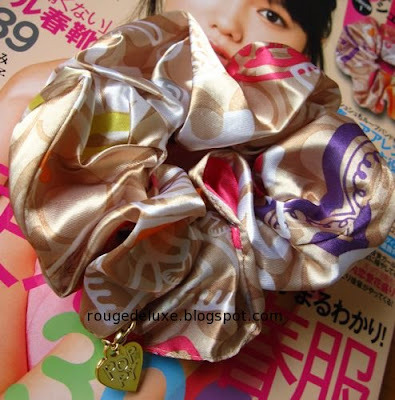 The scrunchie is made of polyester, as is typical of these magazine accessories. 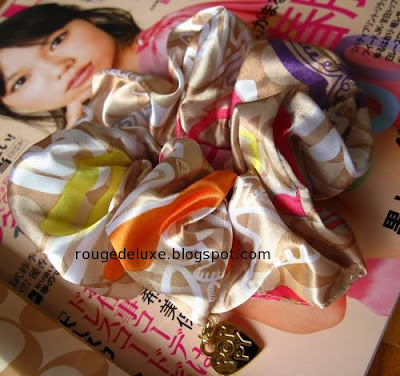 The elastic stretches out to just the right size, not too small and not too large. 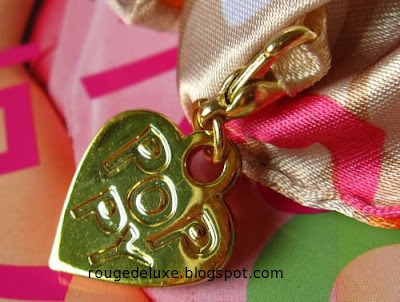 The small gold heart charm can be detached. 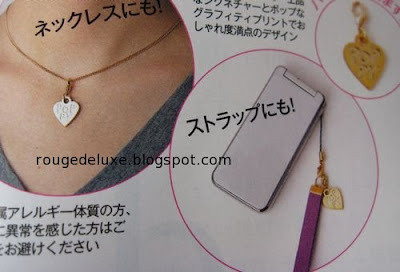 Other ideas on how to use the heart charm. 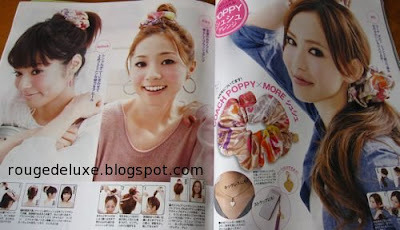 Hairstyles to try with the scrunchie. 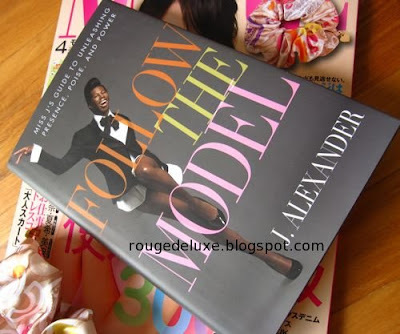 Also picked up J. Alexander's Follow the Model (S$38.22) book. J. Alexander is best known as one of the judges on America's Next Top Model and the ultimate catwalk guru. Walking may seem like the simplest thing to do but it's actually an art, as the model wannabes quickly learn at the tutelage of J. Alexander, who also has longer and more shapely legs than most of the models. 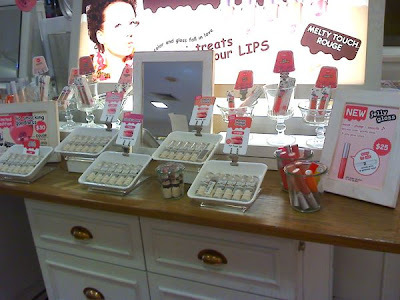 Spotted the new Ettusais Melty Touch Rouge and Jelly Gloss at the counter in BHG (Bugis Junction) today. The Melty Touch Rouge (S$30) comes in six limited edition shades. The finish is sheer and glossy. Do check out Kathi's review over at Lotus Palace! 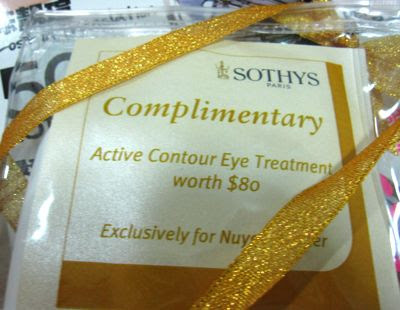 Kinokuniya is giving away a 3-piece Sothys skincare set and a voucher for an Active Contour Eye Treatment with the latest issue of Nuyou magazine (S$5). Got this for my mother and she was extremely pleased as Sothys is a pricey prestige brand. 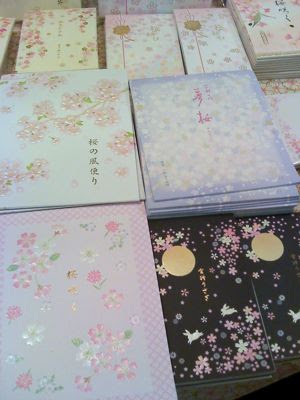 This GWP is exclusive to Kinokuniya. Also spotted these new mooks out at Kino in Bugis: Nimes, Snidel, Free's. 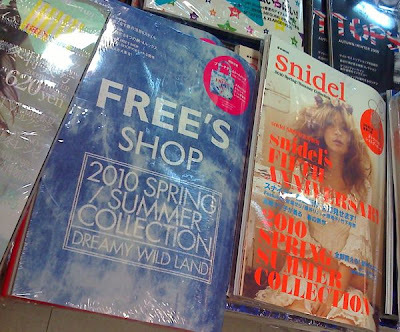 The Nimes and Snidel mooks cost about S$28-S$29. 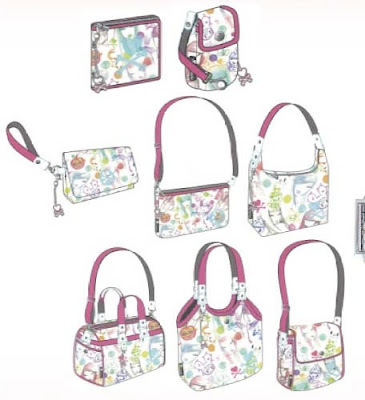 The Fasio Spring 2010 collection is out at Watsons stores. The collection includes five new Shade Trick Eyes (S$21.40) and two Hyper Stay Mascara Magna Plus in Curl Long and Curl Volume. 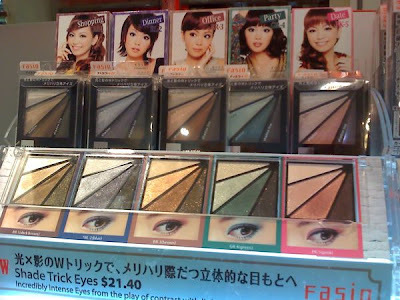 The Shade Trick Eyes combinations looked very attractive under the store lights, with their twinkling shimmery finish. 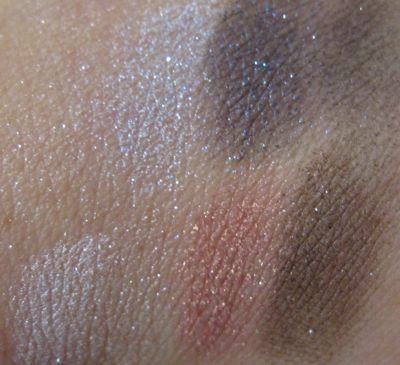 While swatching these, I realised that the four shades in each palette had a slightly different texture. The white shade in each palette had the smoothest, most finely milled texture with a soft pearl glimmer while the second lightest had a more shimmery and sheer finish. 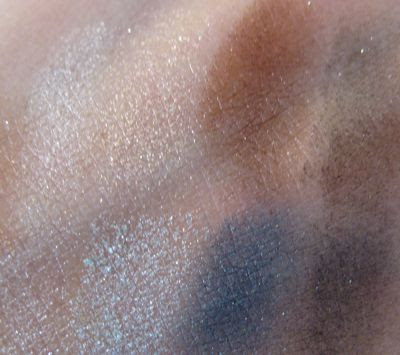 The second darkest shade had a very smooth texture and well-pigmented metallic finish while the darkest shades swatched dry and somewhat chalky. I swatched these without the help of any base/primer. 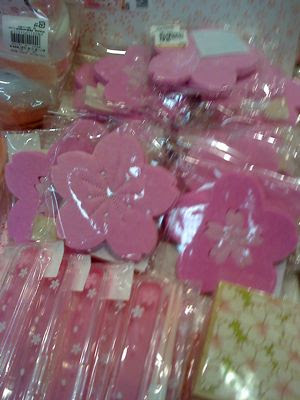 Watsons is currently having a 20% discount on Fasio but the discount is supposed to exclude new and promotional items. (It's still worth checking with the cashier first if these are eligible for the discount as previously the Majolica Majorca holiday collection were also eligible for the discount despite being newly released.) 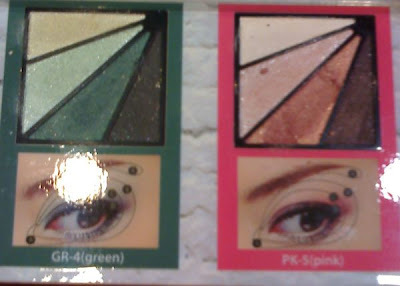 Of the five palettes, GR4 is my favourite thanks to the lovely deep emerald shade in it. BR3 Brown and GR4 Green. The medium green shade in GR4 has more of a emerald tone to it than it appears in the pics below. Majolica Majorca Jeweling Eyes BL711 is a palettes of shimmery pale pastels that would probably work best on fair complexions. The shades are mostly cool-toned with a lovely smooth finish. They apply sheer at first but can be layered for greater intensity. 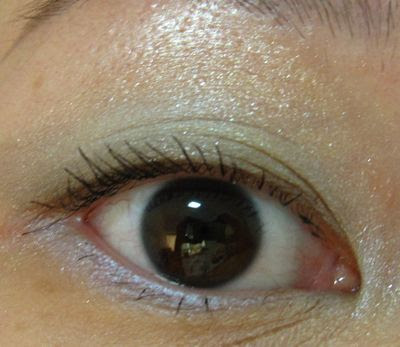 I used the included sponge applicator to apply the white shade on the browbone area, the pale mint from the upper lashline to the crease, the brown shade along the upper lashline and the light blue shade along the lower lashline and inner corners. 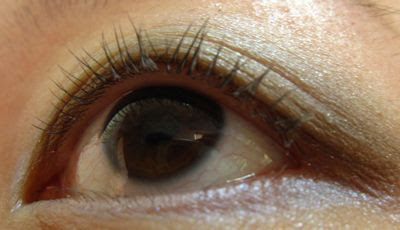 The brown shade is not very intense or dark so if you want greater definition, you will need to use a separate eyeliner. 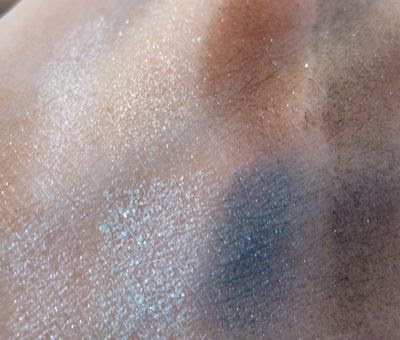 The blue shade applies with a more of an icy tone, and not as blue as it looks in the pan. Overall, this palette would be quite easy for most ladies to wear and apply as the shades are not crazily pigmented or bright. 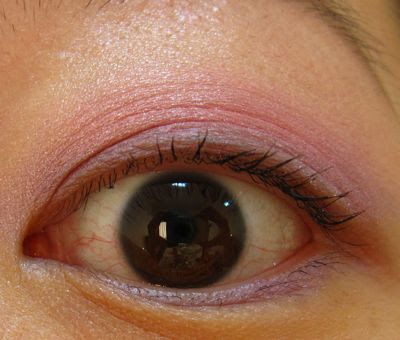 They complement one another quite well for a fresh spring look that livens up the eyes without turning ashy. The Lash Enamel Glamour Volume On has a double-edge comb applicator for adding volume and length. Unlike the previous version of Lash Enamel Glamour, the new version contains short fat fibres, 'volume up powder', gloss oil and waterproof polymers. As its name suggests, Lash Bone Black Fibre In contains black fibres in a clear base and is to be used as a mascara primer. Here's a pic of my bare lashes for comparison. 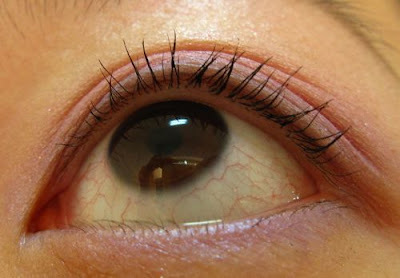 Pic below shows Lash Bone Black Fibre In applied. This felt a bit like applying glue! 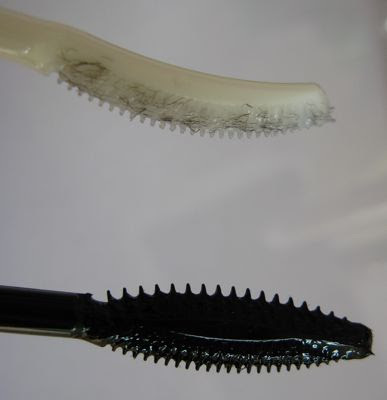 The applicator tends to deposit a bit too much product at the base of my lashes, which are sparse and thin, but it does add length and helps to hold the curl. 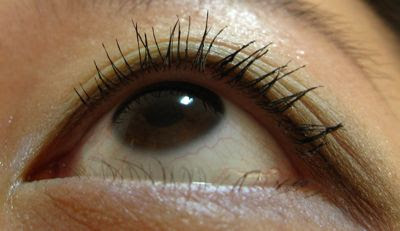 Pic below shows Lash Enamel Glamour Volume On applied. While I like the glossy jet black formula and lengthening effect, the new comb design is tricky to get the hang of as it tends to deposit too much product which leads to clumping. This can probably be easily rectified by wiping the excess product off the wand with tissue first. Overall, I thought the comb applicator took too much work but I do like the mascara formula as it glides on very smoothly and builds visible length and volume from the very first stroke, unlike some other brands which take several strokes to build up length and volume. My lashes also stayed curled without being weighed down.